Dab Antenna. It can be used not only as universal 2Din unit, but also as special unit for NISSAN cars. Adopt the newestAndroid 8.1 Oreo OS, 1024 600 HDCapacitive Touch Screen,Quad Core 1512MHz CPU,2GB RAM and16GB Internal Storage, Support extended 2 Card/3 USB Stick up to5 32GB. Bluetooth: Auto Answer: On/Off, Auto Connect: Yes/No. - A2DP (Bluetooth Stereo Music): Yes, can play stereo music through Bluetooth. - Compatible Format: DVD, DVD-R/RW, HDVD, MP3, MP4, CD-R/RW, VCD, DIVX, WMA/JPEG. Beep: On/Off. - Bluetooth: Auto Answer: On/Off, Auto Connect: Yes/No. - A2DP (Bluetooth Stereo Music): Yes, can play stereo music through Bluetooth. - Bluetooth IC: Integrated. - Compatible Format: DVD, DVD-R/RW, HDVD, MP3, MP4, CD-R/RW, VCD, DIVX, WMA/JPEG. MIRROR LINK for Apple and Android phones. This one with the Lastest tech MIRROR LINK. You can link your phone (support apple and Android) to the play via USB Cable. And mirror link function only support Iphone withbelow IOS system 12.0, and Iphone X and above version can't use the mirror link function. Speed and red light warning.Speed detection & alert when exceeding speed limit. 7" HD Capacitive touch screen, Compared to resistive screens，it is more sensitive to touch and faster response. With Front USB2.0 port and TF card slot. 1 Din Radio. 2 Din Radio. - Beep: On/Off. Radio Tuner with RDS, 30 Preset Radio Stations (FM: 3 6, AM: 2 6). - RDS: On/Off. 6.2" Radio. Special Radio. - 1 16GB TF Card. 1 DIN UNIT. 2 Din Unit. - Built-in DAB Player App: Yes, just connect a DAB Box to use this function. ANDROID SERIES. It can be used not only as universal 2Din unit, but also as special unit for NISSAN cars. Support Torque Pro(OBD2 &Car): Yes, you can connect a Bluetooth OBD2 Scanner Tool to use this function. - Operation System: Google Android 8.1. - Built-in DAB Player App: Yes. - DAB Box In: One. - Explorer: Opera, UCWeb, SkyFile, Dolphin and more explorer for your selection. 7 Inc h 1Din All -in-One Design with motorized retractable Monitor and detachable frontpanel, Adopt the newest Android 6.0 Marshmallow OS, 1024 600 HD Capacitive Touch Screen, Quad Core CPU, 2GB RAM and 16GB Internal Storage, Support extended 2 Card/2 USB Stick up to 4 32GB. 1 DIN UNIT. 2 Din Unit. - Built-in DAB System: Yes, just connect a DAB Box to use this function. - DTV Box In: One. - Connection Port: Special, just support our DAB Box ES355. - Beep: On/Off. - RDS: On/Off. DAB Box & Antenna. Single Din DVD Player. Double Din DVD Player. It can be used not only as Universal 2 Din unit, but also as special unit for NISSAN cars. Adopt the newest Android 8.0 Oreo OS, Capacitive Touch Screen, Octa Core 1512MHz CPU, 4GB RAM and 32GB Internal Storage, Support extended 2 Card/3 USB Stick up to 5 64GB. DAB Box & Antenna. Single Din DVD Player. Double Din DVD Player. Adopt the newest Android 8.1 Oreo OS, 1024 600 HD Capacitive Touch Screen, Quad Core 1512MHz CPU, 2GB RAM and 16GB Internal Storage, Support extended 2 Card/2 USB Stick up to 4 64GB. 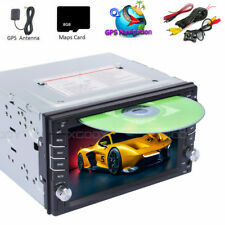 RadioMobile RM-7505MP3BK Car Stereo Radio MP3 AUX CD Flip Front. ISO connection. In used but working condition. Comes with Cage, Radio, Flip Front, Case, and Plastic Surround. Sounds great, have been using this for several years until a recent upgrade. In good condition generally, full working order, some small marks as you would expect on a used item. Would prefer collection in person but willing to post if you're willing to pay for it. Just connect your phone to the receiver via AUX-IN for easy listening favourites directly from its source. The audio receiver playbacks MP3 and WMA music files so you get the best of both worlds. The radio function gives you variety in music genre. Excelvan fitting cage is exactly what you need to mount a new radio double din stereo into your car's dashboard. Easy Installation: Just fix the side bracket onto the stereo with screws and mount the cage from the back of the unit, then clip it into the bracket, easy to install. AUX in port can connect to your cellphone or MP3 to play music. Bluetooth hands free call and bluetooth music playing, make your driving safer, reduce fatigue driving. Built-in Bluetooth microphone. The Sony XAV-60 is an In Dash Receiver suitable for your car when you want to enjoy music on the move. Unit Size S Double Din. Player Type CD Player. This may not be suitable as a gift. Player Features. WiFi: Built-in WiFi Modem, support 802.11b/g/n. - Operation System: Google Android 9.0. - Built-in DAB Player App: Yes. - DAB Box In: One. - Explorer: Opera, UCWeb, SkyFile, Dolphin and more explorer for your selection. New BLAUPUNKT Liverpool 110 4X40W Single DIN Bluetooth USB SD AUX IN Car Radio CD Player Stereo Headunit. Driving is to a large extent automatic behavior – which stimulates the desire to do other things. 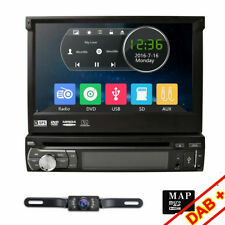 Android 8.0 Double 2Din Universal Car Stereo TPMS 4G DAB WiFi. - SupportA2DP Bluetooth, can play stereo music through Bluetooth from your Phone. -Radio Tuner withRDS, 30 Preset Radio Stations (FM: 3 6, AM: 2 6). New & Genuine w/ 2 Yr Wrty & FREE 8GB USB Flash Drive! Built-in DAB System: Yes, just connect a DAB Box to use this function. - Connection Port: Special, just support our DAB Box ES355. 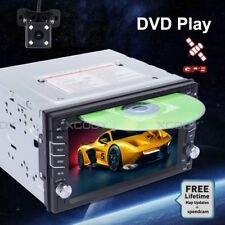 Two Din Car DVD Players. 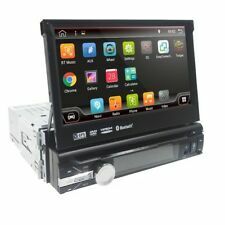 One Din Car DVD Players. - A2DP (Bluetooth Stereo Music): Yes, can play stereo music through Bluetooth. Beep: On/Off. - Play MP5 Videos: Yes, can play RMVB Videos up to 1080P. - Bluetooth: Auto Answer: On/Off, Auto Connect: Yes/No. - Drag and drop Icons: Yes, the position of icons can be changed at will. Featuring a touch screen and smart user-friendly interface, you can get the most out of your stereo system with easier accessibility. You are wrong if you think that’s the only feature this stereo has!